Prof. Murray Loew (BME) has received a one-year, $42,500 grant from the GW Cross-Disciplinary Research Fund for a project titled “Development of a novel radiomics platform to predict outcomes in advanced head and neck cancer.” The grant is a collaboration with Prof. Robert Zeman, chairman of Radiology, and Prof. Sharad Goyal, who will arrive in September as professor and director of the Radiation Oncology Division. Prof. Mona Zaghloul (ECE) is the principal investigator on a nine-month, $45,200 grant from the Department of Energy for the project “Surface Acoustic Wave Enhancement of Photocathode Performance.” The project is Phase I of a three-phase SBIR/STTR (Small Business Innovation Research/Small Business Technology Transfer) grant. Under the grant, GW will work with the company Muons, Inc. to develop photocathode electron sources that can be incorporated into a conventional electron microscope to achieve more versatile capabilities. Surface Acoustic Waves (SAW) on piezoelectric substrate can significantly suppress recombination effects and enhance efficiency, and this project aims to develop the use of SAW on photocathodes to control their emittance and improve their efficiency. Prof. David Broniatowski (EMSE) has published the following article: E, Y. Klein, E. M. Martinez, L. May, M. Saheed, V. Reyna and D. A. Broniatowski (2017). “Categorical Risk Perception Drives Variability in Antibiotic Prescribing in the Emergency Department: A Mixed Methods Observational Study,” Journal of General Internal Medicine. Prof. Samer Hamdar (CEE) has published the following article: A. Talebpour, H. S. Mahmassani, and S. Hamdar. “Effect of Information Availability on Stability of Traffic Flow: Percolation Theory Approach,” Transportation Research Procedia. DOI: 10.1016/j.trpro.2017.05.006. Prof. Russell Hemley (CEE) and his colleagues at the Department of Energy-supported Energy Frontier Research Center have published the following article: H. Liua, I. I. Naumov, R. Hoffmann, N. W. Ashcroft, and R. J. Hemley. “Potential high-Tc superconducting lanthanum and yttrium hydrides at high pressure,” Proceedings of the National Academy of Sciences. The research suggests that new materials—novel hydrogen-rich lanthanum and yttrium hydride structures—could be room-temperature superconductors. The other authors of the paper are affiliated with the Center’s partner group at Cornell University and include Nobel Prize winner, Roald Hoffmann. Profs. Shahram Sarkani and Thomas Mazzuchi (EMSE) and EMSE graduate student Stuart Young have published the following paper: S. H. Young, T. A. Mazzuchi, and S. Sarkani. “A framework for predicting future system performance in autonomous unmanned ground vehicles,” IEEE Transactions on Man and Cybernetic Systems, Vol. 47, No. 7, (2017), pp 1192-1206. Stuart is advised by Prof. Mazzuchi. Prof. Ken Chong (MAE) gave a plenary lecture at the 2017 International Conference on Smart Structures and Materials, held June 5-8 in Madrid, Spain. His 14-page plenary paper, titled “Convergence of Technologies in Manufacturing, Mechanics and Materials,” appeared in the conference proceedings. On June 2, Prof. Lance Hoffman (CS) led a discussion on a paper by John Grant of Palantir titled “Toward the Ethical Engineer: Promoting Ethics Education for Computer Science Students” at the Privacy Law Scholars Conference at the University of California, Berkeley. He also spoke on the topic “Cybersecurity and Privacy: The Challenges and Opportunities (and Necessity) of a Multidisciplinary Approach” at the University of California, Los Angeles on June 6. 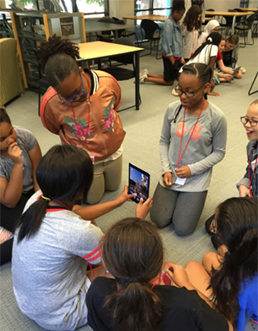 Prof. Shelly Heller (CS) is leading the two-week Middle School Girls Cyber Security Day Camp hosted by GW and funded by the National Security Agency. The camp is designed to provide the young women with the information and skills to “cyber-safe”—by securing their personal and family computers, by learning about privacy issues, and by learning appropriate self-presentation on the internet. The camp’s second goal is to engage the young women in hands-on activities focused on the 10 cybersecurity principles. Finally, the camp is designed to raise awareness about potential careers and career paths in cybersecurity. Prof. Heller expects that by meeting with many women already employed in the cyber field, the campers will see the need to stay engaged with science and math as they move through middle school to high school and beyond. CS graduate students Michael Esposito, Juhi Agarwal, and Mochen Xie, and CS undergraduates Narina Meli and Pat Cody are assisting with the camp. BME doctoral candidate Aleks Klimas won first prize at the 8th International Biophotonics Graduate Summer School, held June 10-17 on the Island of Ven in Sweden. Aleks is advised by Prof. Emilia Entcheva (BME) and works in her lab on optogenetics-aided high-throughput systems for cardiac electrophysiology. The purpose of the 8th International Biophotonics Graduate Summer School was to provide education for students at the highest international level within the emerging areas of biophotonics. Prof. Danmeng Shuai (CEE) and his graduate students attended the AEESP conference at University of Michigan Ann Arbor. Qinmin Zheng and Hongchen Shen gave oral presentations of the development and application of photocatalytic graphitic carbon nitride for persistent micropollutant removal and antimicrobial application. Tao Ye and Ruochen Zhu gave poster presentations of Pd-based catalysts for nitrate removal and photocatalytic membranes for fouling mitigation, respectively. Qinmin Zheng received the CAPEES Founding President Best Paper Award, and Hongchen Shen received the Stantec Travel Award. The SEAS Rocket Team competed in the Inaugural Spaceport America Cup, held June 20-24 in Las Cruces, NM. They launched a student-designed-and-built sounding rocket to 10,000 feet above the ground in a collegiate competition with students from 91 top engineering universities, including teams from Brazil, Switzerland, Egypt, Turkey, and Canada. 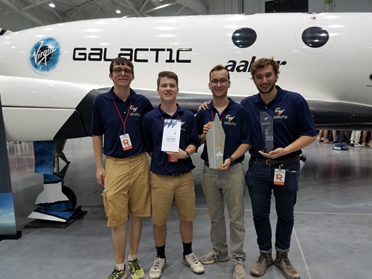 The SEAS Rocket Team placed second in the Space Dynamics Laboratory payload challenge out of 40 schools that entered the payload challenge. The team’s rocket, code named “Project Armadillo,” carried a 4-kg payload consisting of a reaction wheel that controls rocket rotation as it climbs to apogee (maximum altitude). The system worked very well, allowing the team to place better than MIT, Stanford, and numerous other top schools in payload competition. Prof. Murray Snyder (MAE) is the team’s faculty advisor. The SEAS Office of Graduate Admissions has produced a series of videos to highlight graduate student research in each SEAS department. The videos are now live on the shared Youtube account.